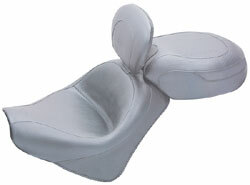 Mustang seats with driver backrest provide excellent back support for the driver and offer more features than any other backrest on the market. Sold as a complete three-piece set including solo, removable driver backrest, and matching passenger seat. Pivots to match your back angle. Pad measures 7" high by 11" wide by 1.5" thick and is contoured to match your back. Folds completely forward for ease of getting on your motorcycle. Rounded thumb screw adjusts backrest forward and back up to 2" while you are seated. Unlike all others, you do not remove the seat or use a wrench. Easily snaps into four height positions or completely out.